30 MILLION Americans Spanked as Adults!!! 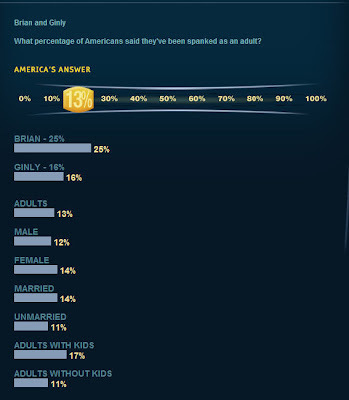 On a recent episode of "The Power of 10", Drew asked the question: "What percent of Americans said they had been spanked as an adult"? The result was 13%. According to the US Census, there are approximately 230 millions adults in the US, so this means that almost 30 MILLION adult Americans have (at least once) received a little spanking action! Hmmm... This explains a great deal!! !